Donations from the British public to help deal with the Asian tsunami have soared to £100m, the Disasters Emergency Committee said on Thursday. DEC chief executive Brendan Gormley said the generosity was "unprecedented" and would help rebuild shattered lives. The news came as the international development secretary compared the devastation to a nuclear explosion. Prince Charles also praised the public's generosity while visiting a Buddhist temple in London. The Prince, who donated an undisclosed amount of money to the Chiswick-based temple's appeal, said: "So many of us find it impossible to summon up words to describe the full horror of this tragedy." He added: "I find it quite inspiring to see the outpouring of generosity that has taken place in this country." Hilary Benn arrived in Banda Aceh, Indonesia, along with a plane load of UK aid sent by the MoD on Thursday. "The only thing I have ever seen like it, and only in photographs, is Nagasaki and Hiroshima," he said. 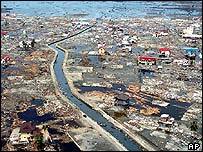 Mr Benn said the scene in Banda Aceh underlined the scale of devastation and the enormity of the needs of people hit by the disaster. He will travel to the Indonesian capital Jakarta, then to Sri Lanka, where more than 30,000 people died. An international conference opened in the Indonesian capital Jakarta on Thursday to discuss how to co-ordinate the relief and reconstruction effort across the region. UN Secretary General Kofi Annan urged donors at the conference to convert aid pledges into $1bn (£534m) cash for urgent use. He said: "Whole communities have disappeared. Millions in Asia, Africa, and even in faraway countries, are suffering unimaginable trauma and psychological wounds that will take a long time to heal." At the summit, world leaders pledged to set up an Indian Ocean early warning system and signed a declaration urging the UN to mobilise the international community for the relief effort. The UK government has so far allocated £50m in aid to the affected countries, but has promised to match the amount raised by the public. Commenting on the British public's reaction to the disaster, DEC chief executive Brendan Gormley said: "The DEC agencies are immensely thankful for the donations that have come in and they are already being put to good use. "The agencies are committed to spending this money wisely and well, and they will be reporting back to the public on what has been achieved." 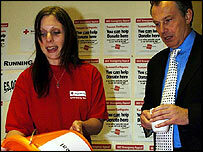 Tony Blair, who praised the public's response as "remarkable" at his monthly press conference on Thursday, has predicted the government would eventually give "hundreds of millions" of pounds in aid. Mr Blair said the Foreign Office had set up temporary offices in all affected areas and everything possible was being done to help with the identification of British victims and the repatriation of remains. Hopes were likely to be fading for those waiting for news about those Britons still missing, he said. Much-needed assistance had already been delivered to the region with the UK meeting every request from the UN, aid agencies and individual countries, Mr Blair added. Help included two RAF C-17 planes, aid flights, three Navy ships, and three chartered Mi8 helicopters being used by the UN in Aceh. And the British frigate HMS Chatham has joined the relief effort in Sri Lanka, with Navy crew helping to clear debris from school playgrounds in one town, and repairing a damaged causeway. An Oxfam-commissioned flight carrying enough water and water purifiers for 2,000 families for two weeks to the Maldives is due to leave the UK later on Thursday. At least 82 people died after the tidal wave hit and more than 12,000 have been displaced there. Pledges to the relief effort have so far topped £1.65bn ($3bn) worldwide.